All scores are claimed scores unless otherwise noted. January: ARRL RTTY Round Up (Final Score) • QSO’s: 889 • Mult’s: 94 • Score: 82,250 • Op Time: 17 Hrs Comment: First place for Indiana low power, single op stations. This contest was the first time I ever had a raw score of 900+ QSO’s in a single operator contest and the first time I ever had 100+ QSO’s on every band in a contest. The solar flux was about 200 for the entire event, and 10M had lots of strong signals. I did not operate the last couple of hours which traditionally is a high rate time, so perhaps that offers my best opportunity for future growth. This was also the first full-bore effort with my newly built contesting PC, which performed admirably. January: NAQP CW (Final Score) • QSO’s: 690 • Mult’s: 183 • Score: 126,270 • Op Time: 10 Hrs Comment: SMC Team Silver. Typically, the last 2-3 hours of this contest are pretty intense with very high rates. Not so this year for me. No one was on 40M, and 80 and 160 were very noisy. I ended up with nearly 100 fewer QSO's than my last full time effort in this event, which was 2012. Although, I did manage to log more multipliers. February: WPX RTTY • QSO’s: 1,066 • Mult’s: 404 • Points: 2,245 • Score: 906,980 • Op Time: 24.5 Hrs Comment: Decided I would make a significant effort in this contest, with a plan to operate 24 hours and with a goal of 1000 QSO's, which would be all-time best for me as a single operator. QSO number 1000 was logged just as my 22nd hour in the chair was coming to a close. I thought for a while that I might also break the 1 million point total but it seems that will have to wait for another day. I spent several days deliberating whether or not I should enter as an all band entry or as a 40M entry. Unfortunately I took one day to many to make my decision and the deadline for submitting an entry expired before I could act. February: NAQP RTTY (Final Score) • QSO’s: 745 • Mult’s: 169 • Score: 125,905 • Op Time: 10 Hrs Comment: My best ever score for the Winter running of this contest. First place for Indiana stations and second place for the 9th call district. March: WIQP (Final Score) • QSO’s: 200 • Points: 306 • Mult’s: 64 • Score: 29,376 (includes 1.5 low power multiplier) Comment: My best ever score for this event. First place for Indiana stations and 6th place US for outside Wisconsin stations. Conditions were good and mobile activity was high. Missed 8 counties which, apparently, were activated. But, with so many counties being covered just by a single mobile, if you miss that activation you are out of luck. March: CQ WPX Phone • QSO’s: 25 • Points: 55 • Mult’s: 23 • Score: 1,265 Comment: Operated from my vehicle using the mobile set up that will be used for the May 2014 INQP. All systems appeared to work FB. Did not submit score. April: MIQP (Final Score) • QSO’s: 38 • Points: 56 • Mult’s: 30 • Score: 1,680 Comment: Originally expected to be out of town for most of the contest but a last minute change of plans allowed me to operate for about an hour off and on. Second place for Indiana SO entries. April: FQP • QSO’s: 110 • Points: 398 • Mult’s: 55 • Score: 21,890 Comment: The traditional warm up for the INQP. About 3.5 hours of op time. May: INQP (Final Score) • QSO’s: 606 • Points: 1057 • Bonus Points: 50 • Mult’s: 112 • Score: 118,434 • Op Time: 12 Hours Comment: A full 12-hour mobile effort with Andy, K9ELF, resulting in a first place finish for Indiana mobiles. We activated 15 counties covering 317 miles in a 2012 Nissan Rogue with Andy handling the phone chores while I did CW. The Rogue is a very quiet car in terms of RFI and also not too bad in terms of road noise, at least for an SUV. Equipment included 7 Hustler resonators on 3 separate masts, two laptops (one for logging via N1MM and one for navigating via Microsoft Streets and Trips), an IC-756ProIII along with other minor odds and ends. 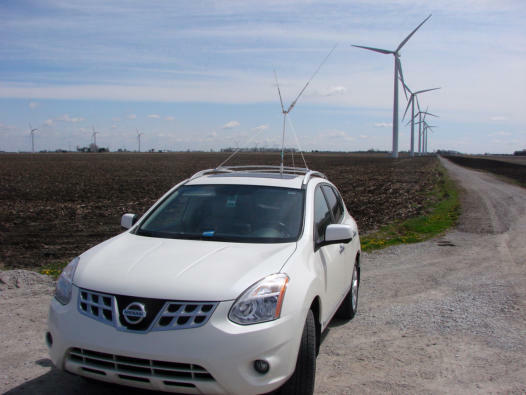 The antennas attach to a NMO mount that is drilled through the roof of the car and require guying. About 50% of our route fell on a county line so we benefited by getting double counts on many QSO’s. Photo (right): the Tippecanoe and White county line at the start of the contest. May: 7QP (Final Score) • QSO’s: 103 • Mult’s: 37 • Score: 10,027 Comment: Run concurrently with the INQP and with K9ELF. Score was good for First Place, Non-7 Mobile Multi-single Low Mixed. May: NEQP • QSO’s: 112 • Points: 188 • Mult’s: 35 • Score: 6,580 Comment: Run concurrently with the INQP and with K9ELF. First place for Non-NE, Multi-op, Single Transmitter, Mobile. 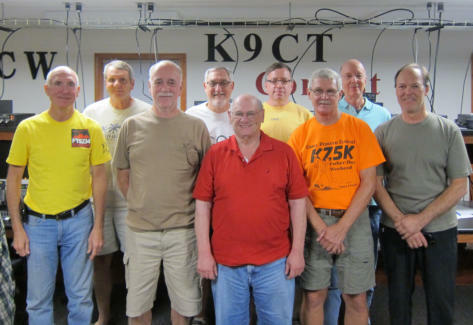 June: Field Day at W9LDX, 1A IN • QSO’s: 1,472 • Points: 4,052 • Bonus points: 1,250 • Score: 5,302 Comment: This score was good for 7th place in the 1A category in addition to being 1st place for the 9th call zone. 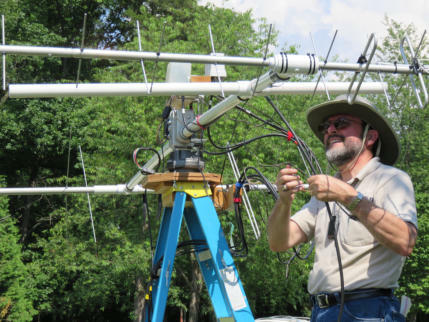 Photo (right): N9IP works on the satellite antennas during Friday afternoon setup. July: NAQP RTTY (Final Score) • QSO’s: 641 • Mult’s: 150 • Score: 96,150 • Op Time: 10 Hrs Comment: Rates at the start of the contest were slow since only 20M had both propagation and activity, but things picked up once eveyone moved to 40 and 80. Thought I would not have enough minutes left at the end of the contest to break the 100K point barrier, but my second-to-the-last QSO was a mult. Fell below 100K after scoring. But, still took first place for Indiana stations and team SMC Lemonade took second place with only four scores submitted. August: NAQP CW (Final Score) • QSO’s: 746 • Mult’s: 170 • Score: 126,820 • Op Time: 10 Hrs Comment: 10M and 15M were worthless at the start of the contest, suggesting that it would not be a good day due to the inability to garner the mult’s needed from these bands along with their QSO’s. But, conditions improved a couple of hours into the contest, and I ended up with my all-time high score for any NAQP. Was also a member of the SMC “State Fair” along with N9CK, W9RE, K9CT and WT9U. Our combined scores totaled 975,216 which, was good for third place in the team competition. August: NAQP SSB (Final Score) • QSO’s: 232 • Mult’s: 88 • Score: 20,416 • Op Time: 6 Hrs Comment: Lots of noise on all the bands and very few signals to be heard. A typical SSB contest struggle. However, I did well enough to capture the 2014 SMC NAQP Challenge cup, which was awarded while I was at K9CT for the 2014 CWWW RTTY contest. September: CW Open Session 2 • QSO’s: 72 • Mult’s: 59 • Score: 4,248 • Op Time: 2 Hrs Comment: Had planned to go full bore in session 1 but heavy thunderstorms made that a non-starter. September: CQWW RTTY @ K9CT • QSO’s: 5,046 • Score: 9,134,349 Comment: We easily broke the old W9 record for this contest but fell short of breaking the old USA record. We still took first place USA and 4th place, world. Our nine-member team included AA5UK, AA8R, AI9T, K3WA, K9CT, N4RR, N7US, N9CK and moi. October: ILQP (Final Score) • QSO’s: 269 • Points: 415 • Mult’s: 84 • Score: 34,860 • Op time: 7.5 hrs Comment: First place for Indiana stations and 3rd place USA. Excellent band conditions and lots of activity. Was able to follow 4 different mobiles as they moved from county to county and always had good copy. This year’s score was a big jump from my 2013 score, which took first place for Indiana stations and eighth place for US stations outside of Illinois. November: SS CW (Final Score) • QSO’s: 731 • Mult’s: 82 • Score: 119,884 • Op time: 19 hrs Comment: First place Indiana Unlimited Low Power. An unusual SS in my experience in that NT stations had only a minimal presence. It’s not unusual for me to miss the sweep, but it appears that many big gun stations with higher scores than me also missed the sweep. This was, nevertheless, my highest QSO and point total ever in a Sweepstakes. November: SS SSB (Final Score) • QSO’s: 409 • Mult’s: 83 • Score: 67,894 • Op time: 13 hrs Comment: First place Indiana for the UL category! I always say I will operate to maximize points and that getting the sweep is secondary. I always get down to just needing 1 or 2 sections for the sweep and cave, losing points while I hunt for the sections I need to complete the sweep. I don’t always get the sweep but this year I did. Next year, I will operate to maximize points and getting the sweep will be secondary. December: ARRL 160 (Final Score) • QSO’s: 293 • Mult’s: 67 • Points: 590 • Score: 39,530 • Op time: 5 hrs Comment: My highest score ever for this contest. 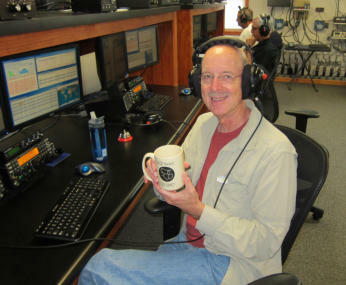 Although, the effort was not about the score but about making QSO’s to harvest points for the ARRL Centennial QSO Party. Third place Indiana and 10th place Central Division for HP Unlimited. December: Ten Meter RTTY (Final Score) • QSO’s: 57 • Mult’s: 37 • Score: 2,109 for Checklog • Op time: 1.5 hrs Comment: As was the case with the ARRL 160 contest, I was trying to harvest QSO points for the ARRL Centennial QSO Party. Operated at high power so log was submitted as a checklog.